The Q FWE Project of the Month for March is Provence Grand Large (Faraman) Designed by SBM Offshore. The first generation floating foundations have been proven in demonstrators. They represent the full spectrum of known floater concepts such as the barge, semisubmersible and the spar. The TLP will be added to that range shortly and it will no doubt be the logical choice for the first commercial projects. The next generation of floating concepts is ready for the demonstrator phase. They distinguish themselves in their design, having been focussed on a lower weight per MW and their modular configuration is more suitable for series production with a possibility of separate, de-centralised manufacturing of components. One example of this generation is the Spanish Saitec SATH (Swinging Around Twin Hull) design. Saitec has tested their design that is composed of two pre-stressed concrete floaters held in a steel frame with a single point mooring. A full size demonstrator is planned for Q2 2020 in the BEbib test area some 2 kilometers north of Bilbao, Spain. 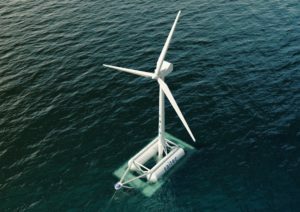 The turbine make has not yet been revealed but will be a 2MW capacity and the unit will remain in operation for 2 years. 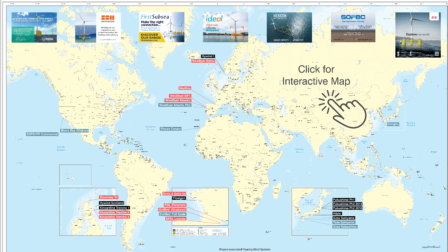 The design is also being reviewed by NEDO for development offshore Japan. 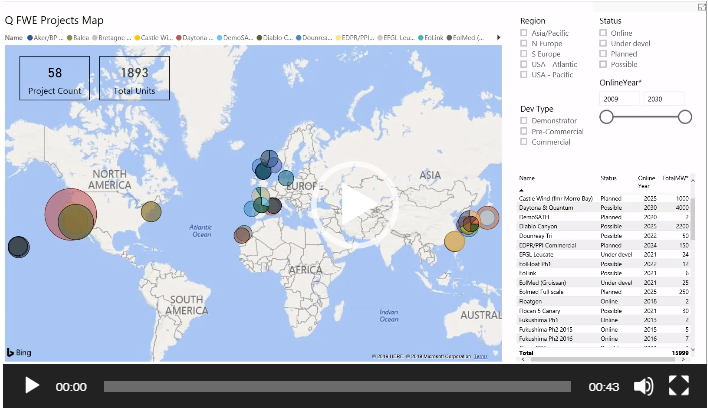 Quest FWE introduces its Project Economics Calculators designed to verify assumptions, make comparisons and/or simply check variable inputs. 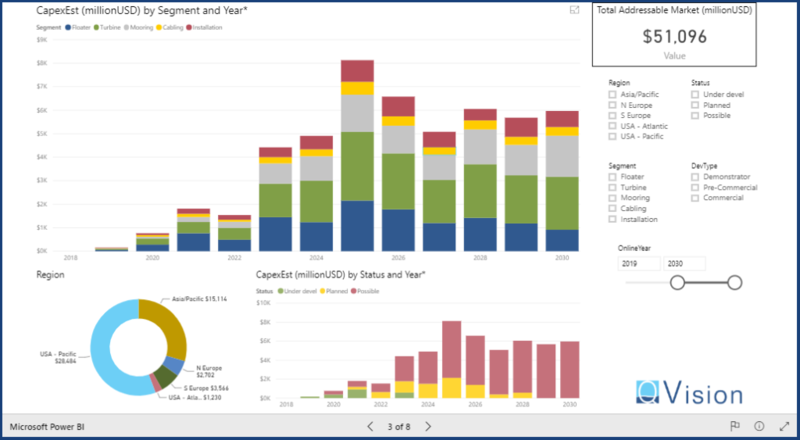 The Q FWE Project CapEx Calculator can be used to determine a CapEx Threshold for your FTU-Floating Turbine Unit Project, based on a 20 year lifespan, allowing user specified inputs for: Turbine Size (MW), Capacity Factor at Location, Electricity Feed-In Tariff, level of annual OpEx, and targeted annualized Pre-tax Rate of Return. 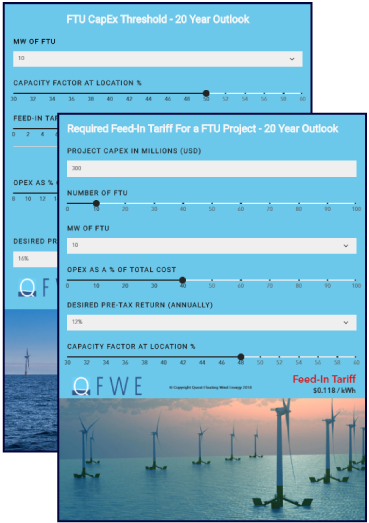 The Q FWE Project FiT Calculator can be used to determine the required FiT (Feed-In Tariff) for your FTU-Floating Turbine Unit Project, based on a 20 year lifespan, allowing user specified inputs for: CapEx, Number of FTU’s, Turbine Size (MW), level of OpEx, targeted annualized Pre-tax Rate of Return, and Capacity Factor at Location.